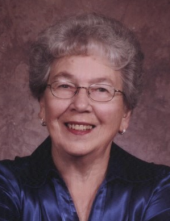 MINONK- Dorothy M. Harms, 89, of Minonk, passed away at 2:10 PM on Wednesday April 10, 2019 at Heritage ManorCare in Minonk. Her funeral service will be at 11 AM on Monday April 15, 2019 at Immanuel Lutheran Church in Minonk with Rev. Joy Miller officiating. Visitation will be one hour prior to services from 10 AM-11AM and burial will be in Minonk Township Cemetery. Memorials may be made to OSF Eastern Region Hospice, 211 North Landmark Drive Suite D3, Normal, IL 61761 or to the church. Calvert-Johnson and Froelich Memorial Homes is in charge of arrangements. She is survived by her children, Barbara (Richard) Kleen, Minonk, Otto W. (Patricia) Harms Jr., Tucson, AZ; grandchildren, Tammy Harms, Douglas (Monique) Harms, Marcia (Kurk) Macphearson, Paul (Tenneil) Harms; and great grandchildren, Christopher, Catherine, Xavier, Warren, Galen, Ruth, and Derek. She was preceded in death by her parents; 6 brothers; and 2 sisters. "Email Address" would like to share the life celebration of Dorothy M. Harms. Click on the "link" to go to share a favorite memory or leave a condolence message for the family.